Research Verified Scar Repair Review - Does it Really Work? The following is a in depth review of the all natural medication by Research Verified, Scar Repair. this medication contains only all natural ingredients that are thoroughly tested and verified through a number of experiments, by their manufacturing company, Research Verified. Scar repair helps to rid your body of old scarring, while at the same time working to rejuvenate your skin; for a cleaner and healthier look. With a one year money back gurantee to go along with it, Research Verified Scar Repair is one of the top brands you will find for scar tissue repair, and rejuvenation. To learn more about this exciting new all natural remedy for scar repair please continue reading. 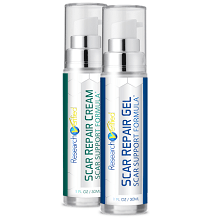 Research Verified Scar Repair comes in both the scar repair gel and a rejuvenating cream. Research Verified suggests applying their Scar Repair gel at a total of three times a day. You should massage it into your scarred area of skin until it has been completely absorbed, each time. It is recommended to maximize the effects of their scar repair treatment that you should then begin applying the rejuvenation cream three to four times a day after applying the scar repair gel. When taken properly and used only externally on your skin, there are no potential side effects with these all natural ingredients. There are many reviews about Research Verified emphasizing the importance Research Verified places on safety and why this manufacturer can be trusted. However, it is warned to its consumers that you should never ingest this medication. If it is ever ingested you must seek medical attention immediately. Research Verified Scar Repair comes in a large variety of packages that include only the scar support gel, only the scar rejuvenation cream, or a combination options with both. The pricing when purchasing either the scar support gel or the scar rejuvenation cream individually is the same. When you buy one bottle they are priced at just $48.00 each. When you order three bottles at once, they are listed at $33.00 each. For their biggest option you can purchase 6 bottles at once that will be priced at $24.00 each. When you want to order a combination of the two they offer the following options. When you buy one scar repair gel bottle with one scar rejuvenation cream bottle you will receive each at a price of $40.00. To order two of each formulas, they are priced at $29.00 each. And lastly, if you want to buy a total of 6 bottles including three of each formula, they will be priced generously at only $24.00 each. Research Verified Scar Repair and Scar Rejuvenation Cream, offers an incredible guarantee to their customers, with a no risk money back guarantee. They understand that it may take longer than 60 days to 90 days for you to reach the results you want, so they offer an incredibly generous, and confident 365 day satisfaction guarantee. Or you receive all your money back from your original purchase. With a policy like this it is no wonder so many customers are writing high quality, and positive reviews of this product. Research Verified Scar Repair and Scar Rejuvenation cream is an all natural option to repair scar tissue, and remove scars. Offering an entire year money back guarantee shows that they are results oriented, and promise their customers that investing in their product , will generate positive results. By adhering to government agency policies for all of their all natural ingredients, you know exactly what you are getting when you order these medications. Its these reasons, and more why Research Verified Scar Repair and Scar Repair Cream’s one of the best available options for scar repair on the market.